1 of 4 Line 10-cup metal or glass bowl (about 8 inches wide) with aluminum foil, extending 2 inches over sides. Spread ice cream in 1-inch-thick layer over inside of bowl, leaving about 6-inch hollow in center. Freeze about 1 hour. 2 of 4 Drain cherries, reserving 3 tablespoons juice. Coarsely chop cherries; set aside. In large metal bowl, whisk yolks, sugar, nutmeg and cherry juice. Place over large saucepan of simmering water. With electric mixer, beat yolk mixture until thick and temperature is 140 degrees F; then cook, beating, for another 3 minutes. Remove from heat; let cool. 3 of 4 In bowl, beat heavy cream until stiff peaks form. Gently fold into yolk mixture; then fold in chopped cherries. Spoon into center of ice cream. Freeze overnight. 4 of 4 Unmold bombe onto chilled platter. Coat with cookie crumbs. Return to freezer. Warm fudge topping as directed. 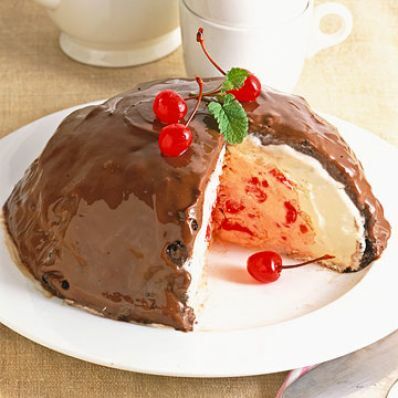 Let cool to 90 degrees F. Spread over bombe. Freeze 1 hour. Per Serving: 96 mg chol., 8 g sat. fat, 1 g fiber, 165 mg sodium, 4 g pro., 300 kcal cal., 16 g Fat, total, 37 g carb.